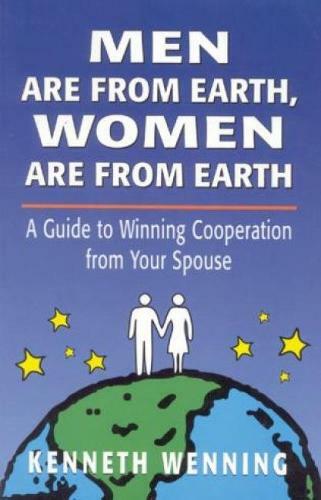 Men Are from Earth, Women Are from Earth is a self-help book for couples in conflict. Its primary goal is to help couples stop fighting and start living together cooperatively-like true partners in life. Toward this end it shows married people how to overcome their self-defeating, relationship-damaging attitudes and behaviors, how to identify and prevent the main cause of emotional disturbance in marriage, and how to win greater cooperation from their mates. It also teaches couples effective communication and problem-solving methods-and ways of finding greater pleasure in married life. Though primarily a self-help book for married individuals, this book is also designed to support any marital therapy effort or any type of individual therapy for a married person who is seeking to improve his or her marriage. It can be used simply as recommended reading for clients who wish to facilitate self-improvement in marriage as well as relational improvement with the spouse, or it can be used as a structured, step-by-step intervention for distressed couples. Either way, both the psychoeducational content of this book and the emotional and interpersonal problem-solving methods it prescribes are likely to help many unhappily married individuals decisively end the marital "madness" and create more satisfying relationships with their partners.